Remember the Milk is my favorite online to-do manager and even has a great RTM iPhone app too. I use Gmail and Remember the Milk extensively everyday. So, naturally Remember the Milk for Gmail Firefox extension has been such a wonderful tool for me. I can access RTM from within Gmail. 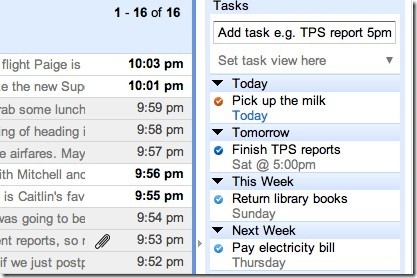 This is pretty huge as I live in Gmail and it makes it so easy to add and manage my tasks. Google Chrome has slowly been gaining my trust because it is so fast to load. Plus, each tab runs as a separate process so even if a web app crashes it doesn’t close the whole browser. Remember the Milk has come out with an add-on for Google Chrome. With the Google Chrome RTM for Gmail add-on, you can manage your tasks from within Gmail. You can complete, postpone and edit tasks. You can add tasks and connect them with your emails, contacts and even Google Calendar events. This is huge as I use both RTM and Google Calendar. You can automatically add tasks for starred messages or specific labels in Gmail! All you need is a free Remember the Milk account and make sure your Gmail language is set to US English. Google Chrome supports extensions only in their recent beta version. Just follow the notice you will get when you try to install the RTM add-on if you are using an older Google Chrome.